(NaturalNews) To all the doctors out there who have even the slightest concerns about the safety of the vaccines they routinely administer to young children, now is your opportunity to come clean and turn those vaccines in for good. 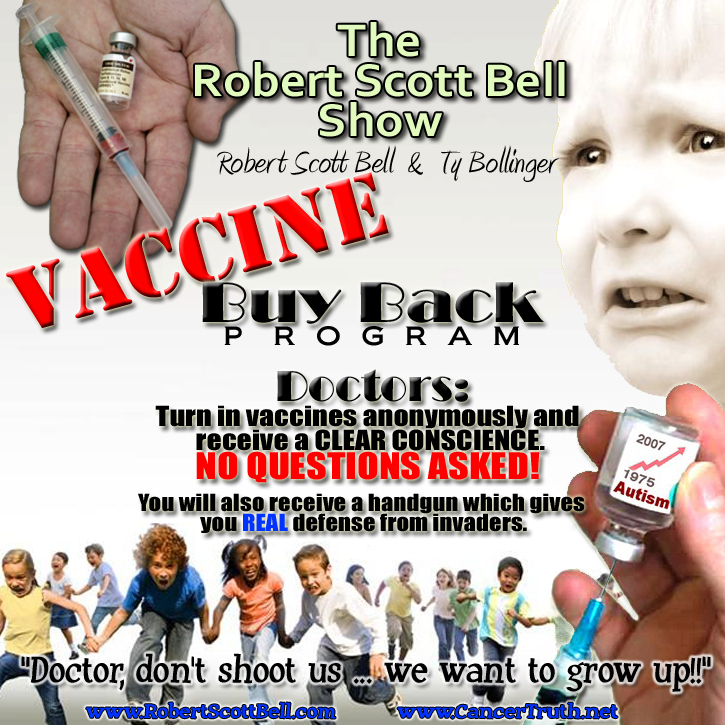 Radio host and natural health advocate Robert Scott Bell of The Robert Scott Bell Show recently announced a "vaccine buyback" program on his show that encourages doctors to turn in their deadly vaccines and instead choose safe, natural alternatives for their patients such as vitamin D and nutrient-dense foods free of genetically-modified organisms (GMOs). The idea was birthed in response to the recently announced Worcester, Massachusetts, gun buyback program, which urges local citizens to turn in their guns for a "free" flu shot (http://www.naturalnews.com). The thought of such an initiative is so absurdly ridiculous that many people initially thought it was a joke. But it turned out to be very real, and something that is becoming increasingly more common nationwide as deranged bureaucrats seek out new ways to both disarm the public and inject them with more poisons. So to counteract this institutionalized demonstration of absolute idiocy, Robert Scott Bell and alternative cancer treatment expert Ty Bollinger hatched the idea of a "vaccine buyback" program designed to reward doctors who voluntarily turn in their vaccines, which Bell accurately refers to as "weapons of mass destruction against innocent and defenseless children." Though the reward itself has yet to be clarified, the point of the program is to draw attention to the fact that vaccines are a far greater public health hazard than guns, at least in terms of the number of victims they claim every year. "Doctors, turn in your vaccines and we won't turn you in," joked Bell during a recent segment of his show, in which he asked listeners to call in or write with creative ideas about what type of gifts could be given to doctors who come clean. "We really would like to hear some of your ideas as to how we would initiate something as worthy, worthwhile, and wonderful as pulling those dangerous weapons off the streets and out of the doctors' offices in America," added Bell. According to the U.S. Department of Health and Human Services (HHS), roughly 13 percent of the 30,000 vaccine cases reported annually to VAERS involve serious injury or death (http://vaers.hhs.gov/about/index). Assuming that just half of this 13 percent, or about 2,000 cases, resulted in death, this means that vaccines kill about four times as many children every year compared to firearm accidents -- and again, these are just the cases that are actually reported to VAERS, which are said to represent only about one percent of all actual cases of vaccine injury. So as you can see, vaccines, and not guns, are the real threat to American children today. If we really want to clean up our streets and give our children the best chance at a normal, healthy, and vibrant life, then the first thing we need to do is get rid of vaccines and begin teaching children how to build their own natural immunity through regular sunlight exposure, clean water, organic and non-GMO foods, superfood supplements and powders, exercise, and various other natural interventions. And the next question is, will doctors, who have vowed to "do no harm," join us on this quest by ditching the jabs and going a different route?